Pale pink, semi-double flowers becoming paler towards the centre. Very free flowering in mid to late season (March and April). An upright, compact and slow growing plant, ideal for the smaller garden and container growing. Good quality compact plant with several flower buds and healthy glossy foliage. Described by Jennifer as a "wonderful hybrid" so I'm looking forward to the spring! 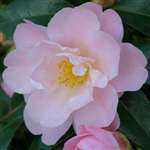 I consulted with Trehane nursery for a suitable camellia which would do well in a container. Of the ones suggested I picked Nicky Crisp. The camellia arrived promptly and well packaged. The camellia looks strong and healthy and I feel is worth paying the carriage cost to buy from a specialist. It was a present for my neighbour who was delighted with it. The camellias I purchased were packaged well, I opened the packaging & was totally blown away by the 2 camellias that I had bought, in flower, plenty of buds & with lovely glossy leaves. Absolutely thrilled.